SmartSequencing with advanced AC protection and noise filtration. 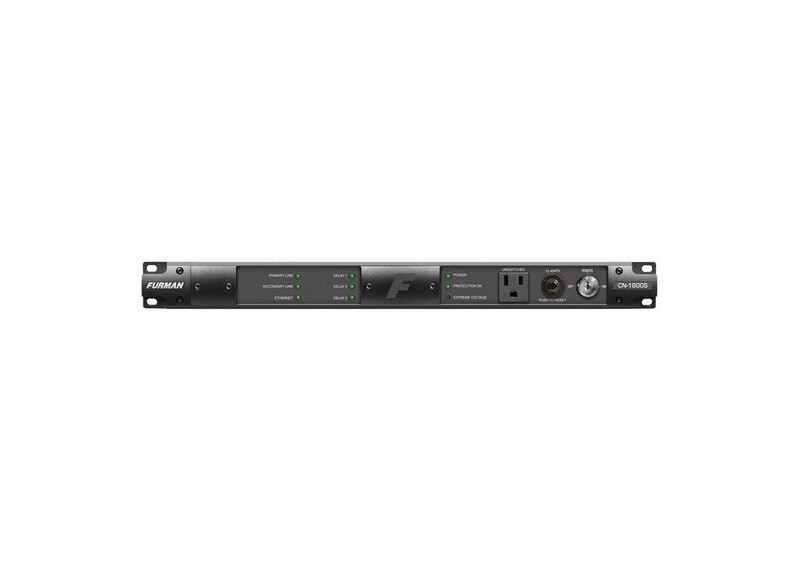 Designed for Commercial A/V Installers, the CN-1800S combines robust control capabilities via SmartSequencing™ Technology, advanced AC protection, AC noise filtration, and optional compatibility with the BlueBOLT® Remote Power and Energy Management Platform (BB-RS232 adapter required, sold separately). The new CN-1800S is one of the first products to feature Furman’s SmartSequencing™ technology, which allows large and complex A/V systems to be safely powered on and off with a simple press of a button or turn of a key, even by nontechnical personnel. SmartSequencing’s bidirectional communications between installed units enables a primary unit to control and sequence multiple secondary units, ensuring multizone electronic systems are powered on and off safely and dependably from a single control point across an entire installation. Units can be connected via current loop at runs of more than 1,000 feet with backwards compatibility with Furman’s legacy sequencers. In addition, the CN-1800S offers robust control options, equipped with RS-232 ports and command sets for integration with control systems. An optional RS-232-to-Ethernet adaptor (sold separately) adds full IP-addressability to the unit, allowing it to be controlled, programmed, and monitored from a smartphone, tablet, PC, or any Web-enabled device via Telnet, direct HTTP: connection, or Panamax/Furman’s BlueBOLT®-hosted remote power and energy management platform. • Surge Protection - Series Multi-Stage Protection (SMP) Technology provides the highest level of surge & spike protection available. • Noise Filtration - Linear Filtration Technology (LiFT) reduces AC noise linearly across a very wide bandwidth for unequaled audio & video clarity. • Voltage Protection - Extreme Voltage Shutdown (EVS) circuity safely powers down itself and connected equipment during unsafe voltage periods. • SmartSequencing™ - SmartSequencing allows bidirectional, safe sequenced power up/down operations via the push of a button or turn of a key. • Diagnostic Lights - Diagnostic lights provide valuable system information including power quality, “Protectection Ok” indicator, and Extreme Voltage indicator. • 15 Amp Output Current - 15 amp maximum current capacity with incorporated 15 amp thermal circuit breaker. • Remote Access (RS-232) - RS-232 compatibility & command set provide integration with control systems, open source and control programming. • BlueBOLT Compatible® - BlueBOLT provides remote access to reboot components, power equipemnt on/off, and monitor power quality via the internet from anywhere in the world. • Nine Total Outlets - The CN-1800S contains eight rear panel NEMA 5-15R outlets and one front panel NEMA 5-15R outlet.